We are one of the most trusted, leading and best cleaning company in Central London. Do you have a hard time maintaining the cleanliness of your house because of increased workload at work? Do you lack the energy? Do you wish you had time to relax in a vibrant and fresh looking home? We understand what you are going through and it is our job to make you feel better and make difference in your life. 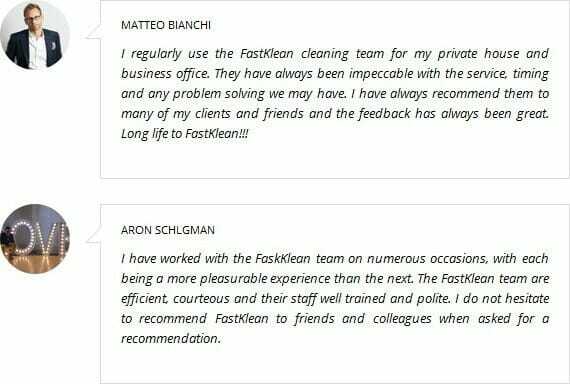 Good thing that FastKlean is helping people who are miserable due to a messy and dirty home. Our customers are usually those that have a busy lifestyle since they cannot manage to set aside time for cleaning their homes. These services are created to match and give solutions to the cleaning problems you face daily. We assure you that these services are carried out responsibly by our honest and professional cleaners. They are well-trained and managed by our supervisors and management team; they are insured and are capable of doing large and heavy cleaning in a short period of time. We guarantee you that our services will provide satisfaction and efficiency since we are committed in giving you what you truly deserve. We offer these services at very cost-efficient and low cleaning rates with no hidden charges. If you have any questions, please contact us at 020 8884 9149 and we will respond immediately.